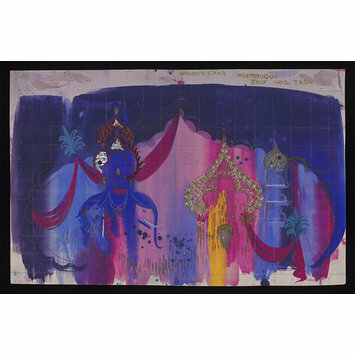 Set design for The Wonderland of the World: Mysterious East' in pantomime The Sleeping Beauty, London Palladium, 1958. The Sleeping Beauty starred Charlie Drake as The King, Bruce Forsyth as Presto the Jester and Edmund Hockeridge as Prince Michael. The show’s scenary was designed by Edward Delany and Tod Kingman and was described as “bold and brazen” by the Sunday Times, featuring settings diverse as an Alpine Village, A Medieval Castle, Paris, The Golden West and the Mystic East. To encorporate Canadian singer Hockeridge into the show, writers Phil Park and David Croft created a backstory for their Prince, who had been raised on the American prairie as a cowboy. This was the only Palladium pantomime to not feature a Dame. 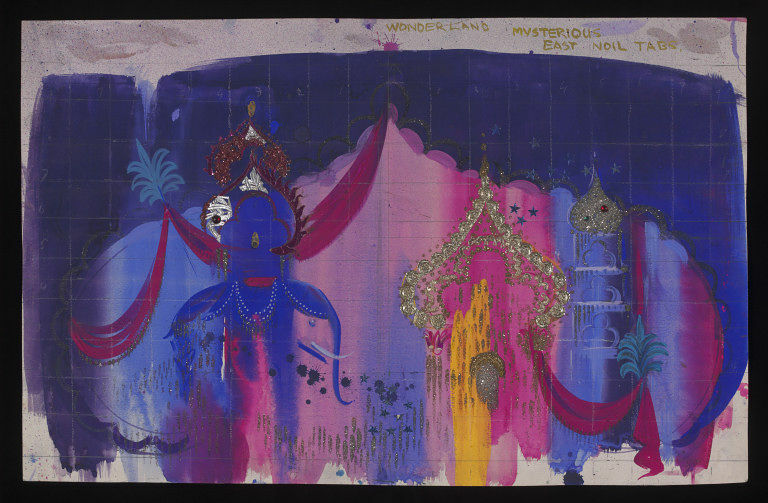 Gouache, watercolour and glitter on card set design for The Wonderland of the World: Mysterious East' in pantomime The Sleeping Beauty, London Palladium, 1958. The deisgn features three blue and pink towers with gold-coloured domes. The background is painted in purple and also features pink drapes along the border.